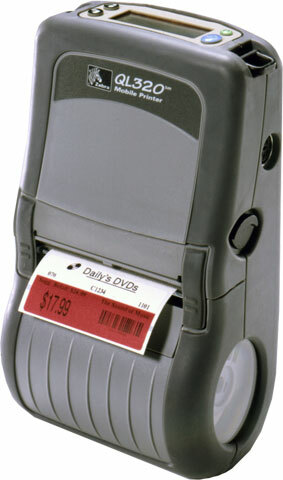 It is replaced by the Zebra QL320 Plus. The QL320 direct thermal mobile printer has been designed with the most advanced technology in rubberized over-molding to maintain both rugged construction and minimal weight. With center-loading media, smart battery monitoring and an optional LCD, it provides user-friendly options to keep your business moving. All units ship with one user's manual. Direct thermal, linered platen, 203 dpi, 3" print width, 2MB SRAM, 2MB Flash, LCD, 802.11b Radio, VAR. Order battery charger separately. See accessories. Power supply (Part# CC16614-G4) not included. See accessories. Direct thermal, linered platen, 203 dpi, 4 ips, 2.9" print width, 802.11b communications, LCD, 2MB SRAM, 2MB flash. Includes battery, belt clip & user's manual. Order battery charger separately. See accessories. Power supply (Part# CC16614-G4) not included. See accessories. Direct thermal, linered platen, 203 dpi, 3" print width, 2MB SRAM, 2MB Flash, LCD, 802.11b Symbol CF-NA, VAR, Belt Clip and ZPL Emulation. Order battery charger separately. See accessories. Power supply (Part# CC16614-G4) not included. See accessories. Direct thermal, linered platen, 203 dpi, 3" print width, 2MB SRAM, 2MB Flash, LCD, 802.11b Symbol CF-NA, VAR, Belt Clip. Order battery charger separately. See accessories. Power supply (Part# CC16614-G4) not included. See accessories. Direct thermal, linered platen, 203 dpi, 2.9" print width, 4 ips Print speed, Serial Interface, 2MB SRAM, 2MB Flash, LCD, 802.11b Cisco 352 PCMCIA-NA, VAR and Belt Clip. Order battery charger separately. See accessories. Power supply (Part# CC16614-G4) not included. See accessories. Direct thermal, linered platen, 203 dpi, 2.9" print width, 4 ips Print speed, 2MB SRAM, 2MB Flash, LCD, IrDA QuickLink Module, VAR and Beltclip. Order battery charger separately. See accessories. Power supply (Part# CC16614-G4) not included. See accessories. Direct thermal, linered platen, 203 dpi, 3" print width, 2MB SRAM, 2MB Flash, LCD, No QuickLink Module, VAR, Belt Clip and ZPL Emulation. Order battery charger separately. See accessories. Power supply (Part# CC16614-G4) not included. See accessories. QL 320 Direct thermal Mobile Printer (3 inch Print width, 8MB RAM, 4MB Flash, CPCL, EPL/ZPL Support, LCD, Bluetooth, Linererd Platen, Group B, China and Beltclip). Power supply (Part# CC16614-G4) not included. See accessories. 8MB/16MB, LCD, US/Canada English, Bluetooth, Direct thermal linered platen, belt clip. This is the TAA compliant version of printer (Part# Q3D-LUBA0000-00) for government purchasers. Please call for more information. Power supply (Part# CC16614-G4) not included. See accessories. QL 320 Direct thermal Mobile Printer (3 inch Print width, 8MB RAM, 4MB Flash, CPCL EPL/ZPL Support, LCD, 802.11b Symbol CF WW, Linered Platen and Beltclip). Power supply (Part# CC16614-G4) not included. See accessories. Direct thermal, 3 inch Print width, 8MB SRAM, 4MB Flash, CPCL EPL/ZPL Support, LCD, Zebra Value Radio 802.11g, Linerless Platen and Beltclip. Power supply (Part# CC16614-G4) not included. See accessories. QL 320 Direct thermal Mobile Printer (3 inch Print width, 8MB RAM, 4MB Flash, CPCL EPL/ZPL Support, LCD, ZVR 802.11b/g, Linered Platen and Beltclip). Power supply (Part# CC16614-G4) not included. See accessories. QL 320 Direct thermal Mobile Printer (3 inch Print width, 8MB RAM, 4MB Flash, CPCL EPL/ZPL Support, LCD, Zebra Value Radio-802.11b, Linered Platen, Beltclip and Time Out STG). Power supply (Part# CC16614-G4) not included. See accessories. QL 320 Direct thermal Mobile Printer (3 inch Print width, 8MB RAM, 4MB Flash, CPCL EPL/ZPL Support, LCD, Bluetooth, Linered Platen, Label Present Sensor and Shoulder Strap). Power supply (Part# CC16614-G4) not included. See accessories. QL 320 Direct thermal Mobile Printer (3 inch Print width, 8MB RAM, 4MB Flash, CPCL EPL/ZPL Support, LCD, Bluetooth, Linered Platen, Label Present Sensor and Beltclip). Power supply (Part# CC16614-G4) not included. See accessories.